Sir David Richmond makes his case against whistleblowing at Kensington Town Hall. Photo by Sophia Spring. In the style of Oxford University debates, there were two teams – one arguing against the motion, the other arguing in favour of it. Each speaker was given no more than seven minutes to make his case, and objections were encouraged in the form of ‘points of information’ or ‘interjections’. After a 20 minute delay because of large queues to get in to the venue, the room fell silent as Frontline Club’s founder Vaughan Smith took to the stage to welcome the audience. 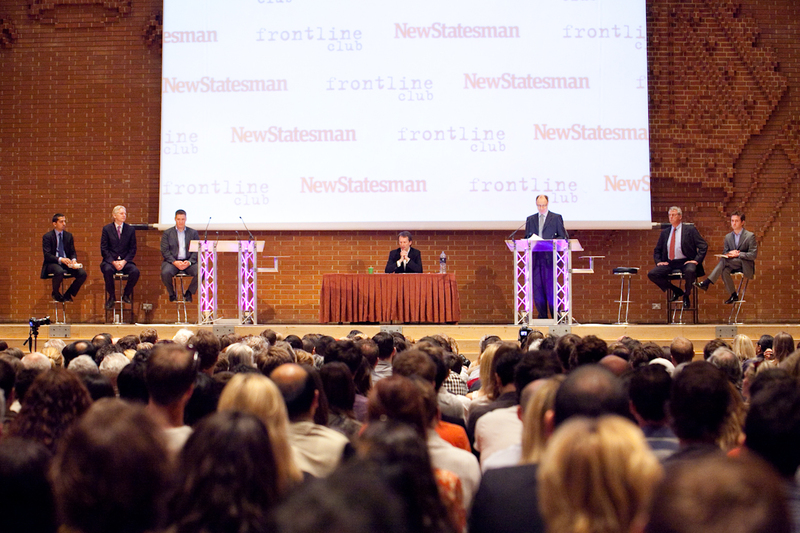 He then introduced the debate’s chair, New Statesman editor Jason Cowley. Each of the panelists gathered silently on the stairway beside the stage, awaiting their introduction. Clayton Swisher was first, followed by Julian Assange and Mehdi Hasan. Then the opposition: Sir David Richmond, Bob Ayers and Douglas Murray. Before the debate got underway, there was an audience vote on the motion. It revealed that the overwheming majority of those in the room believed whistleblowers did indeed make the world a safer place. Swisher was first to take to the podium. A previous US federal investigator turned journalist, he spoke at length about what he described as “unprecedented government secrecy”. He went on to describe data journalism of the kind pioneered by WikiLeaks as “the future”, before recounting the problems al Jazeera faced in January prior to the publication of the Palestine Papers. Interestingly, Swisher revealed the British secret service – Mi6 – had directly pressured al Jazeera to prevent publication of an alleged MI6 agent’s name prior to the release of the Palestine Papers. “We were under tremendous pressure from the British government,” he said. “In fact, we fielded calls from MI6 to withhold publication of the name of an alleged MI6 officer who proposed a secret rendition programme to take mid level operatives and intern them with EU funding. Now this is a plan that is illegal under international law. But, in a direct attack on WikiLeaks, he condemned the leaking of information on a massive scale. “Genuine examples of whistleblowing are buried in an avalanche of classified material that shows no abuse at all,” he said. He dismissed previous speaker Sir David Richmond’s position, before making his case against secrecy. He went on to describe whistleblowers as “courageous individuals” who in difficult circumstances engage in “squirreling out” information. He also took a jab at the mainstream media, describing it as “rarely” an “honest conduit”. Referencing the Iraq War Logs as well as Cablegate, Assange criticised the Chilcot Inquiry into the Iraq war, calling it a “set up”. He then reached his conclusion, in which he made an underreported and often overlooked clarification on his position, by asserting that he does in fact not believe in absolute transparency.